Home » Where is Good to Ski Right Now? Ski areas across Europe are seeing a very snowy end to the season with some receiving as much snow in the past week as they have had all year. The heaviest snow fell at the end of last week when some Italian resorts claimed as much as 2 metres of snow fell in 72 hours, but it has kept snowing in many areas ever since, just not so heavily. The heavy snow fell across most of central Europe and down in the Dolomites too where the 1 metre of snow that some resorts in the Dolomiti Superski region reported falling in 24 hours was almost as much as they had had all season. 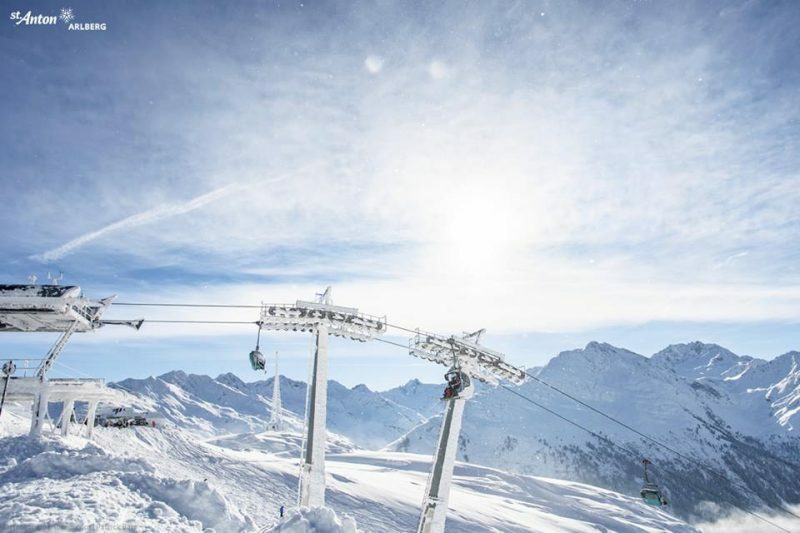 Several big name resorts reported a metre of snow, or more including Andermatt, Engelberg, Serre Chevalier, Val Gardena and Verbier. Engelberg’s snow took their base depth up over 7 metres on their upper runs, the first time this season any ski area anywhere in the world has passed the 7m snow depth mark. All the snowfall wasn’t entirely all good news though. The avalanche danger rose from very low to high in many areas, although it has dropped back down again to level 1-3 (low to moderate) in most. The snowfall this week has also been accompanied at times by (depending where you are), rain, strong winds, low cloud or fog, so skiers have to pay back something for the pleasure of fresh powder in mid-April. That said the sun has been back out in the Western Alps (France and Western Switzerland in particular) most days this week giving great conditions there with the fresh snow, albeit more like classic spring skiing with lower slopes getting sticky by lunchtime. And against all these weather trends are the reality that we are getting further in to the final month of the season for most areas and more and more resorts are closing each weekend. Most ski areas in Eastern Europe have already closed. Elsewhere in Europe there’s been snow falling in plenty of other areas too. The Pyrenees have seen more fresh snowfall so far in April than they did in all of March. Formigueres in the Frech Pyrenees reported 40cm of snow on Thursday. 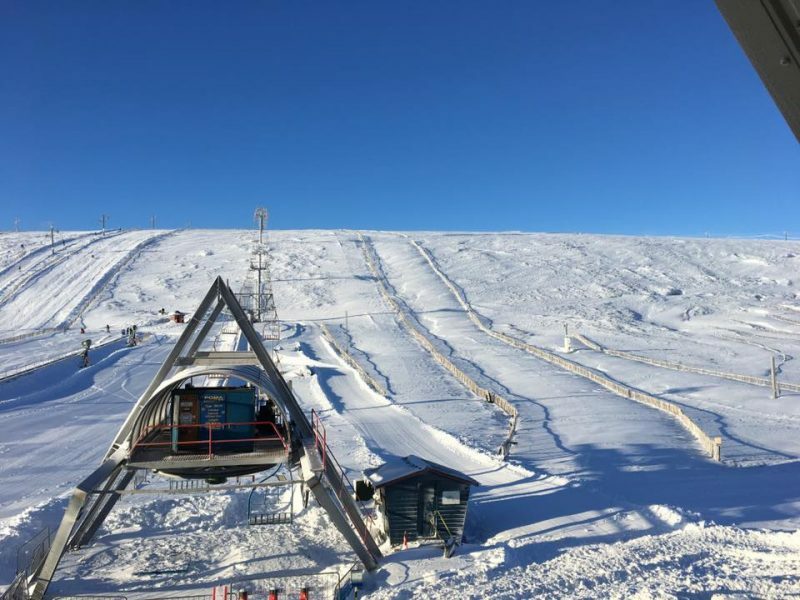 Even out in Portugal, at the country’s one ski area, Serra de Estrella, Europe’s most westerly, they’re hailing the most snow they’ve had all winter and hope to stay open to Easter weekend at least. 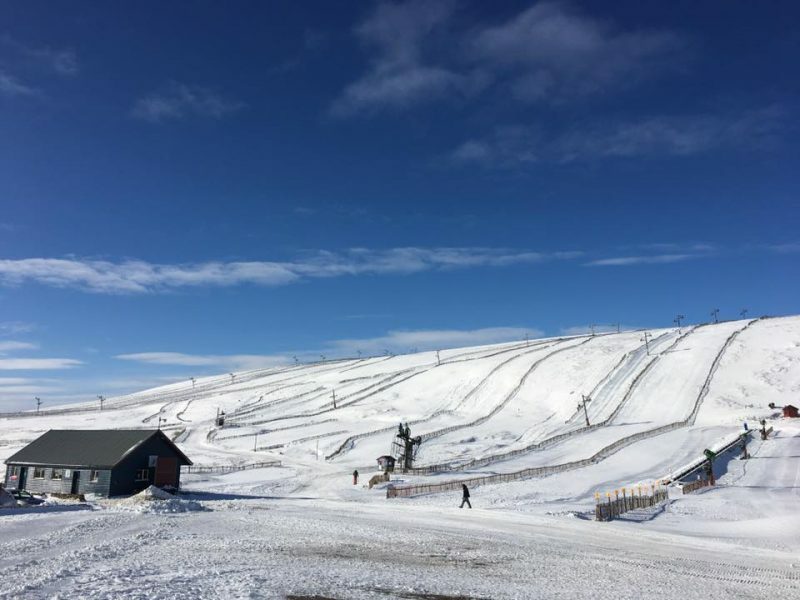 Scottish ski areas also got a good snowfall to end last week – up to 50cm accumulated – but have unfortunately (for skiers) seen warm weather at the start of this week which has once again thawed a lot of the new snow cover. At time of writing though four ski areas (Glencoe, Cairngorm – pictured below today, Nevis Range and The Lecht) had at least some terrain still open. Across the Atlantic ski areas tend to close a little earlier than in the Alps and most will be ending their seasons this weekend if, like Jackson Hole, Telluride and others, they have not already. There are however still more than 100 areas open. The most snow in North America for the first half of this week was reported in Quebec where most of the still-open areas have reported 20-40cm of fresh snow. 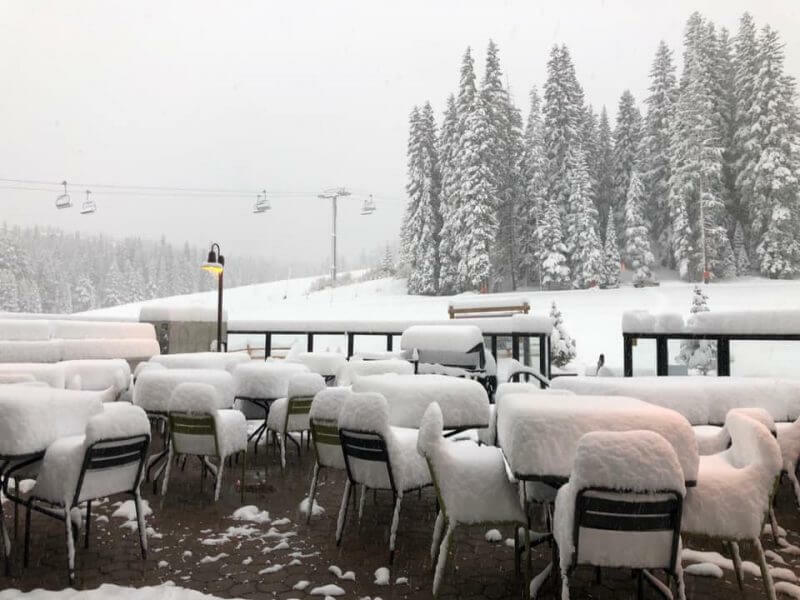 More recently there’s been heavy snow in the Western US again with Utah seeing up to 60cm of fresh powder, as pictured above at Alta on Wednesday. 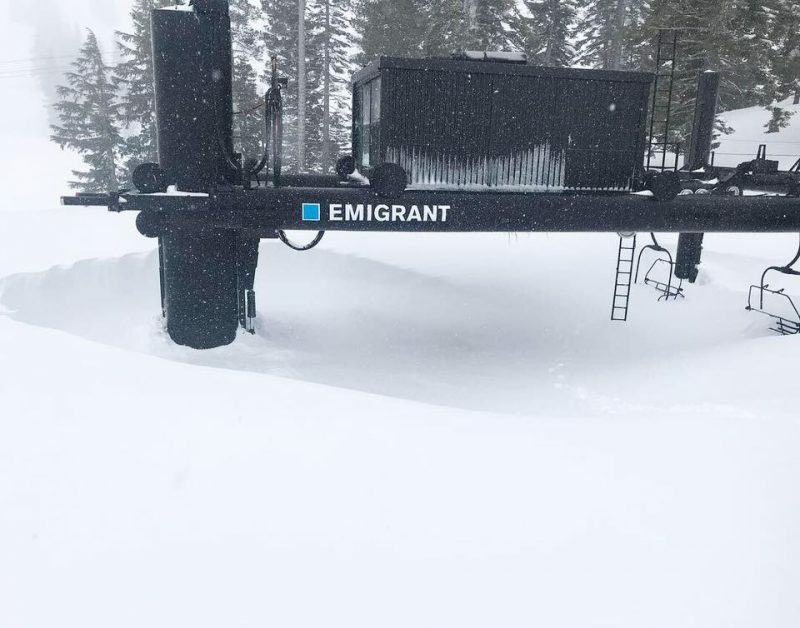 The deepest snow remains in California where half a dozen areas have 5-6 metres of it lying and several have said they’ll stay open to late spring or early summer, there’s been a little fresh snow here and at other Western ski areas in the past week. It has been a remarkable few days for snowfall in the Alps, particularly when you consider we’re into the start of April and some resorts have already closed for the season last weekend, a chunk more will do so this coming weekend. Ski areas in Austria, France, Italy and Switzerland have all reported huge snowfalls, some as much as 2 metres between Wednesday and Friday this week. For most, it has been more like 30-60cm, but wherever you look, it has turned to midwinter with lots of fresh, deep powder. Engelberg, which already posted the world’s deepest snow base a week ago at 6.3 metres, has increased that total to 7.3 metres after more than a metre of snow fell there. 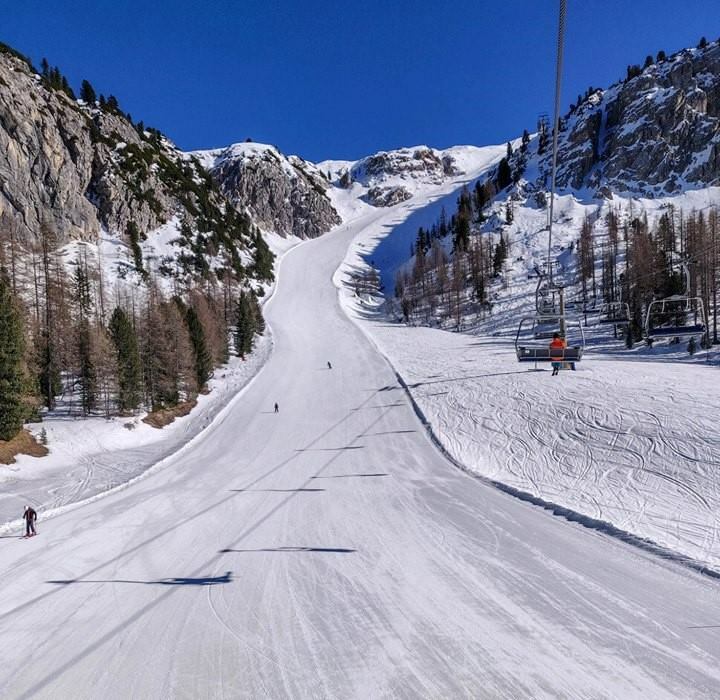 It’s open through to the end of May and with the snow depth in the village increasing to 80cm it looks like top to bottom skiing over its full 2000m lift-served vertical may remain skiable right to the end. Andermatt, which has had 1.2 metres (4 feet) of snow is pictured top, Solden, which got a metre in 24 hours, above. All the snow has caused resorts some issues opening and clearing access as well as setting the avalanche danger up to level 3 or 4, – considerable to very high – for off-piste areas. 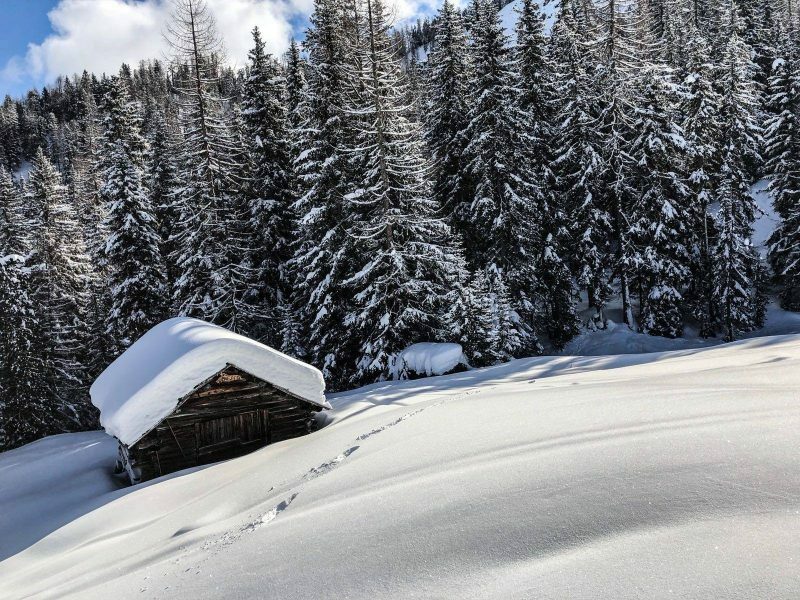 Ski areas in the Dolomites have also had heavy snowfall with Alta Badia, Val Gardena and Val di Fassa among the areas reporting at least a metre of snow by Friday morning. For some, this was more than the total snowfall in the first three months of this year. Pictured below is a mountain restaurant in the Fassa Valley on Friday. Elsewhere in Europe it has not been as snowy but there has still been considerable snowfall in the Pyrenees and even down at Sierra Nevada on the southern Spanish coast, Europe’s most southerly resort. So here too there’s been some fresh April powder. 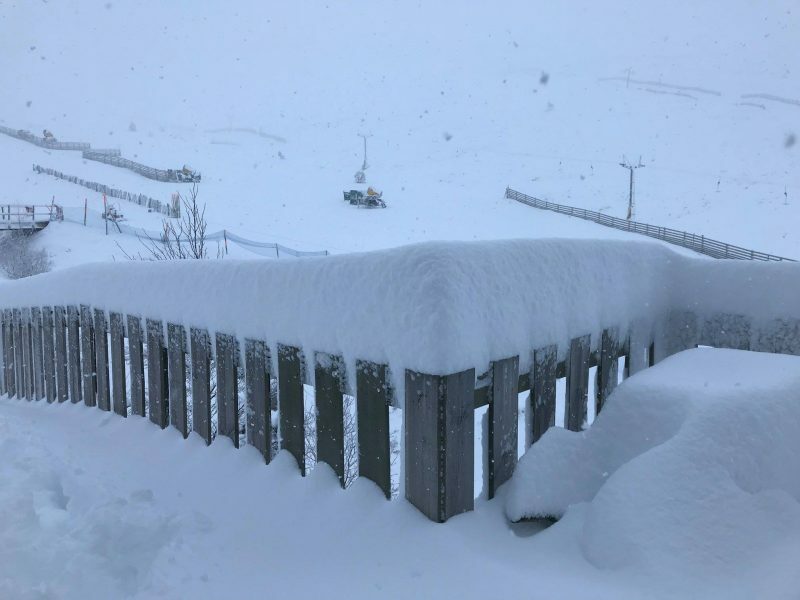 There’s been lots of snow in Scotland too, enabling Cairngorm, pictured below on Wednesday, and The Lecht which had closed after a thaw last week to re-open their slopes for the start of the Easter holidays. Glencoe and Nevis Range on the West were still open anyway having survived the thaw. Scandinavia has had fresh snow too in the West and North in particular with Riksgransen reporting a 4-metre depth, the region’s deepest. It hopes to stay open to late June and offer skiing under the midnight sun in May, and so far that’s looking promising. Across the Atlantic it has been a less snowy week than in Europe, that is after ski areas in Utah got about a metre of snow last weekend. There’;s also beena lot of gloruious suinshine, such ats here at Marmot Basin in Alberta where the season still has a month to run. Resorts have begun closing there and big names like Crested Butte and Jackson Hole are due to end their seasons this weekend. There has been more fresh snow, particularly in the West, and there’s more forecast for the week ahead, but so far nothing major. Even though we’re moving deeper in to spring, and some ski areas are even starting to close for the season, It has been a snowier and cooler week over the past seven days than it has been for the previous two. 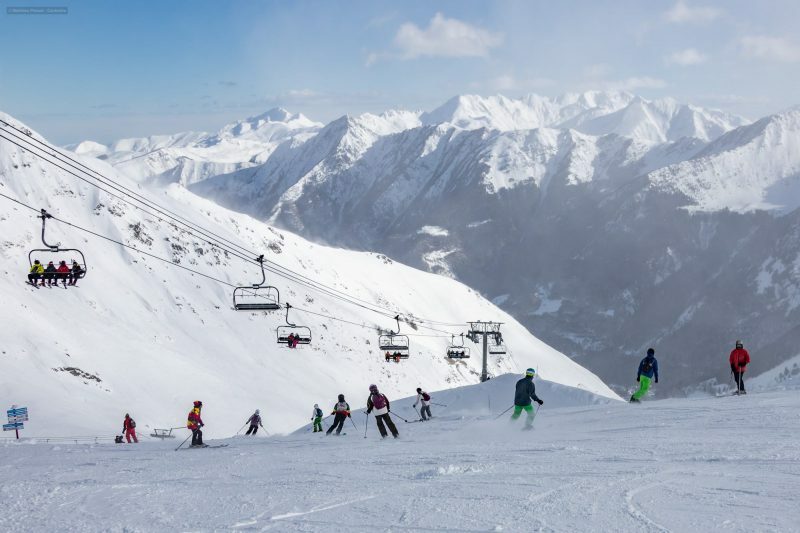 Snow arrived back in the Eastern Alps (Austria, Easter Switzerland, southern Germany and northeastern Italy) at the weekend and ended up depositing up to 50cm of fresh cover on the mountains. 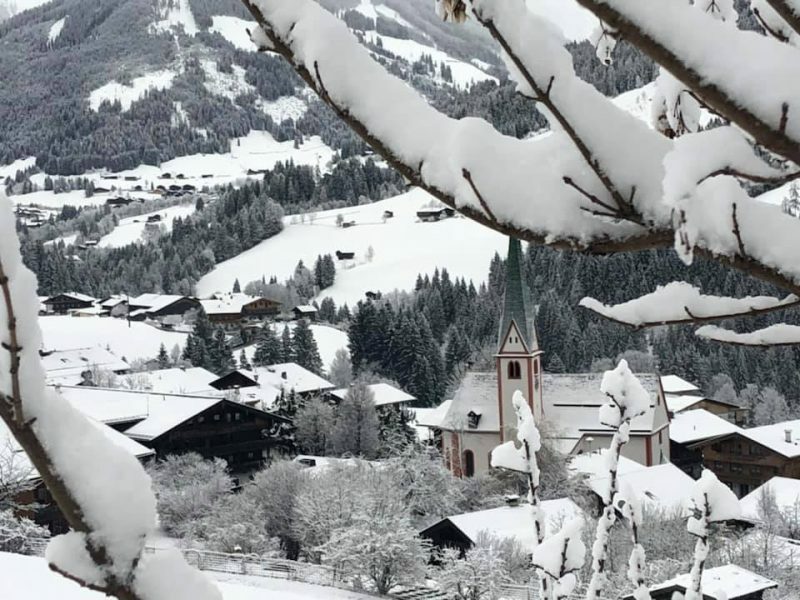 Resorts like Laax, St Anton, Saalbach and the Zugspitze all posted a foot (30cm) or more of fresh snow in the 24 hours up to Tuesday morning. St Anton, pictured top and below, reports the snow depths on its highest slope (Not part of the official measurement) are at nearly 7 metres. At the same time temperatures, which had been reaching double digits above freezing dipped the other way and we saw some -15Cs again 3000m up on the slopes and temperatures staying sub-zero, or almost, down in resort too. It’s now warming up and returning to more regular springlike conditions with overnight freezing of the snowpack and daytime thawing, but it’s good to have the fresh cover on top. There’s been no fresh snow to talk of in the western Alps (France, Western Italy and Western Switzerland) but bases remain good here to see out the season. Elsewhere in Europe the Pyrenees got some fresh snow, just a few centimetres, over the weekend. Some smaller, lower resorts are struggling to stay open through to the end of the season due to the thin base there and rapid thaw and at least one has opted to close a week early, last weekend, for the season. However in Andorra there’s a thick snow cover and all runs are open as we head towards the Easter holidays. It’s a similar issue in the Dolomites with little fresh snow here and thin bases in places, but skiers are still enjoying some glorious sunny days on the pistes with everything open. For consistent fresh snow Scandinavia is the place to be, again, with lots of 20-30cm daily falls reported in resorts like Voss and Hemavan. 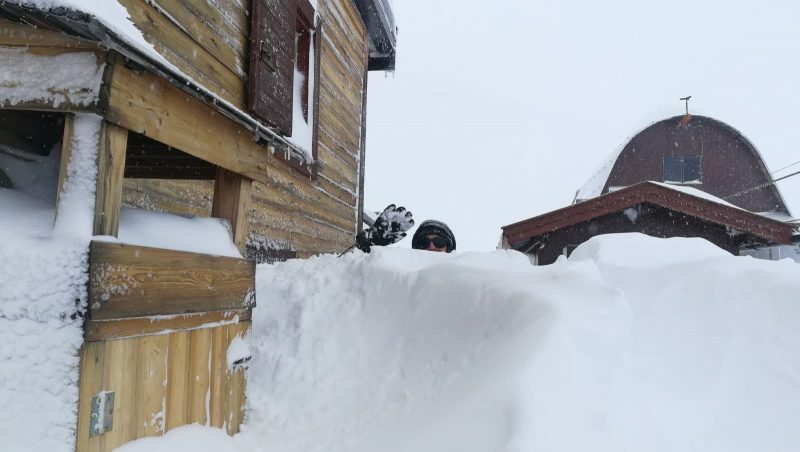 The biggest accumulations have been reported up at Riksgransen in the Arctic Circle which only opened for its 2019 season a few weeks ago and aims to stay up to midsummer in late June. It’s had more than 40cm of snowfall this week. 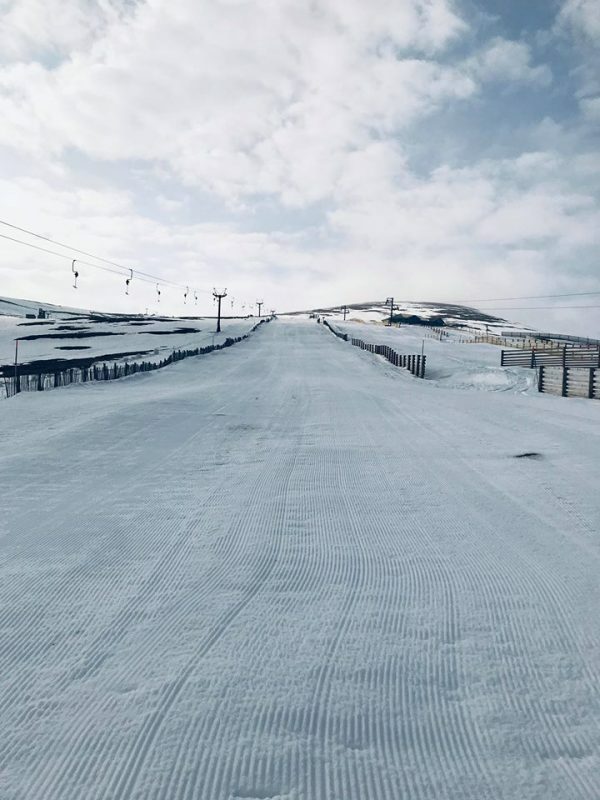 Scotland has also had fresh snow but unfortunately it arrived after another period of rapid thaw at the end of last week which unfortunately wiped out most of the cover at Cairngorm, Glenshee and The Lecht and the new snow isn’t enough to allow them to re-open. Glencoe and Nevis Range have survived the thaw however, and in fact Glencoe (pictured above on Monday) has some great conditions with more snow forecast this weekend. 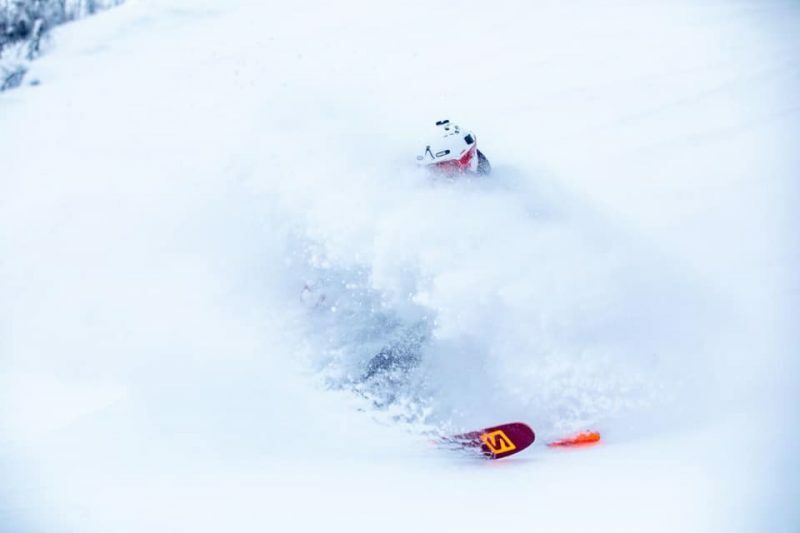 Over in North America the Eastern side of the continent saw some heavy snowfall over the weekend with the biggest accumulations in Vermont where up to 90cm fell over the three days. More recently there’s been snow in the west with Californian ski areas seeing another 30cm+ fresh snow on top of their huge bases, and fresh snow from BC up in Canada (Where Apex in BC in prictured above on Tuesday this week) down to Colorado too, so it’s a snowy end to the season here. 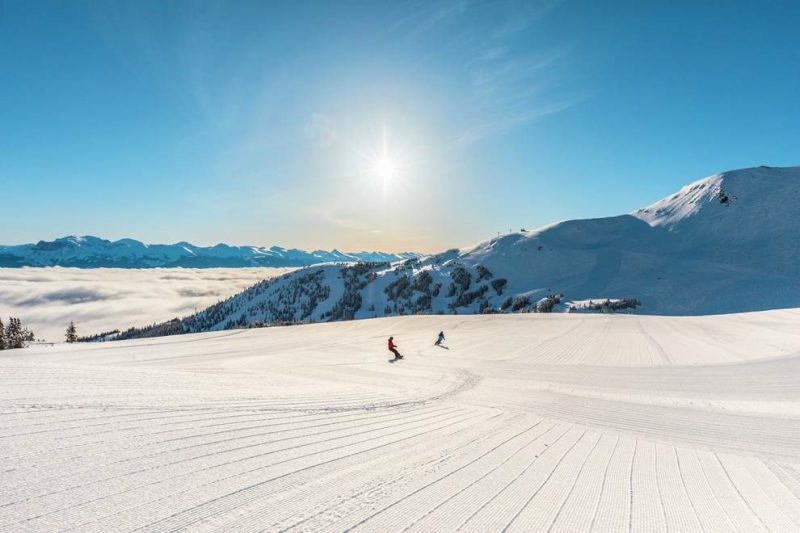 After a snowy end to last week, the weather in the Alps has been fairly settled with some glorious, sunny, spring days for skiers and boarders to enjoy. Of course for those looking for fresh powder that news isn’t always good news, but we are now in to spring, with just a week or so of March left and, well, like it or not, winter has to end eventually! That’s not to say it isn’t easier the find powder this week compared to last. The heavy snowfall that ended last week (and continued in to the start of this at some areas) brought up to 1.5 metres (five feet) of fresh snow cover in the Alps and there are plenty of shaded powder pockets remaining if you have a good guide to take you to them. Most resorts got at least 50cm of fresh snow up high; Verbier reported 70cm, Saalbach and the Zugspitze more than a metre. 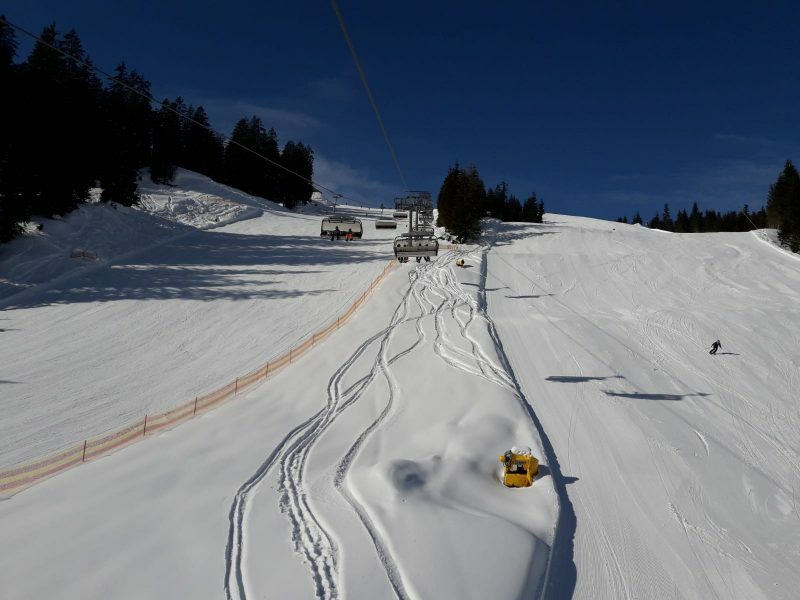 Alpbach is pictured below after fresh snow there. For the majority that stay on the piste the news is that the fresh snow revitalised the groomed runs too and took the deepest bases back over the three-metre mark at resorts like Les Arcs and La Rosiere, the first time the snow depth has been more than 10 feet for some time in France. Swiss depths remain the world’s deepest though with more than 6 metres (20 feet) still lying at Andermatt and Engelberg. The avalanche danger is mostly at level 2, moderate, in the French and Western Swiss and Italian Alps but in the East including eastern Switzerland, Italy and Austria it’s at level 3, considerable, in many areas. Eastern Europe is seeing similar conditions to the Alps. Jasna in the Slovak Republic is pictured above. Generally temperatures in the valleys are getting as high as double digits above freezing in the afternoon so a thaw is well underway and precipitation is often back to falling as rain when it arrives, and as snow higher up. However most areas either have deep enough snow on their slopes down to resort level or are ab le to push snow down the mountain to fill any gaps that appear sop continue to offer top to bottom skiing. Down in the Pyrenees there’s been a little fresh snow in recent days. Our top image is from the Spanish resort of Baqueira Beret which reported 10cm of fresh snow on Wednesday. Up in Scandinavia it has been very snowy with plenty more snow in Norway, Sweden and Finland is also in the best shape it has been all winter. Levi, now fully open, is pictured below. The same can be said for Scotland which has re-opened more slopes this week than it has had open all season up to now, thanks to three weeks of cold and often snowy weather since the big February thaw. It has been rather warm again the past few days which may be a minor set back but colder weather and more snow is forecast for the weekend. The Lecht is pictured below this week. Across the Atlantic it has been a quieter week for snowfall in both Canada and the USA. 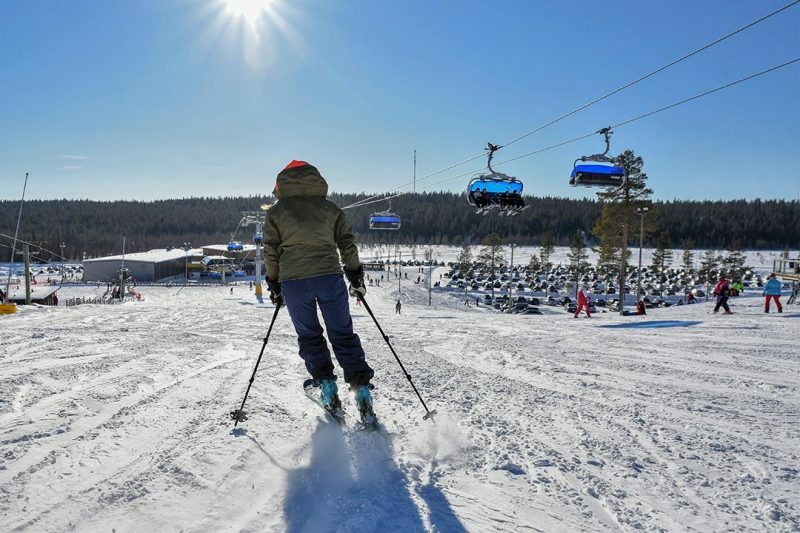 Indeed a rapid thaw has led some resorts in traditionally warm states like New Mexico to begin closing but then New Jersey’s Mountain Creek area has, unusually, extended their season to the end of the month. The East Coast is due to get a lot of snow over the next few days right up to Quebec though, with up to 50cm/20 inches forecast. On the west, there’s a return to snowier weather expected but it has been warm and the avalanche danger risk has been set at ‘very high’ by official bodies in regions like BC, Canada due to the instability of a rapidly thawing snowpack. The far North West, Alaska, is the one part of north America that has seen big snowfalls this past week with more than six feet of snow for Alyeska, pictured below. 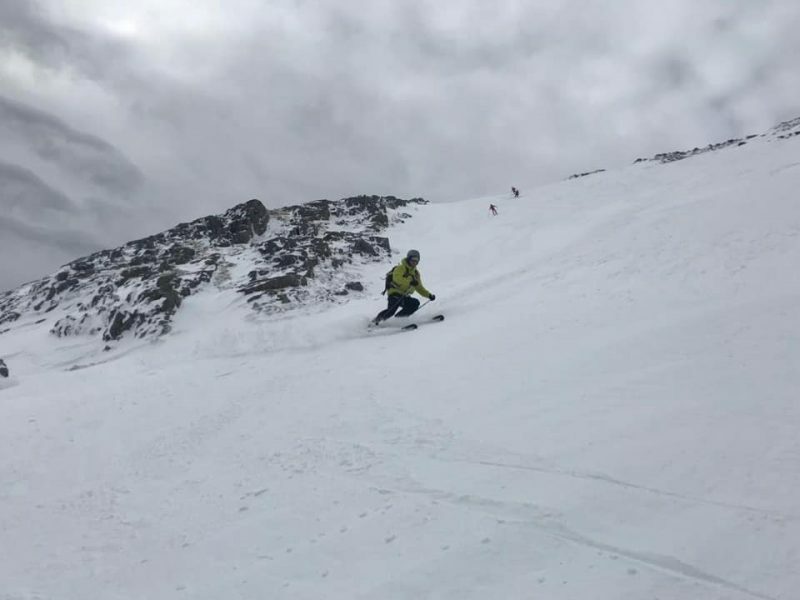 Where was good to ski week commencing 14th March 2019? It has been the snowiest week in the Alps for some time with some resorts reporting almost a metre of snow already, and it’s currently dumping down again meaning five-day totals at some Swiss areas may get up towards 1.5 metres (five feet). The snow is falling over a wide area from the Southern French Alps in the west across to the Northeastern Alps and the Tatra mountains of the Czech and Slovak Republics as well as Poland. Heavy snow has been reported in Jasna in Slovakia for example, but the weather is changeable with strong winds blowing in at times, leading to the evacuation of higher slopes in Alpe d’Huez at the start of the week with some non-skiing visitors in mountain restaurants needing to be brought down on snowcats as high lifts were closed. Jarné prázdniny skončili, ale zimná sezóna stale pokračuje :)Takto to u nás vyzerá dnes..
Whilst it has been generally cold on the ski slopes there have also been reports of rain at times down in low valley ski resorts as spring starts to take hold at lower elevations. But higher up the snow is good and it’s getting deeper, Engelberg just overtook Andermatt for the first time this season to post the deepest base in Europe (and the world) at 616cm (20.5 feet) after 30cm of snowfall in the past few days there. Elsewhere in Europe, there has been some fresh snow in the Pyrenees but otherwise, conditions are distinctly springlike with top to bottom skiing but in the valleys, the only snow left is what’s pushed down on the slopes. It was a similar picture in the Dolomites although here snow forecast may turn things much whiter over the next few days if it falls as promised and right down to the valley floor as snow. Scotland’s stop-start-stop ski season is starting again with lots of snow showers through March so far after the warm February thaw (Glencoe pictured above). 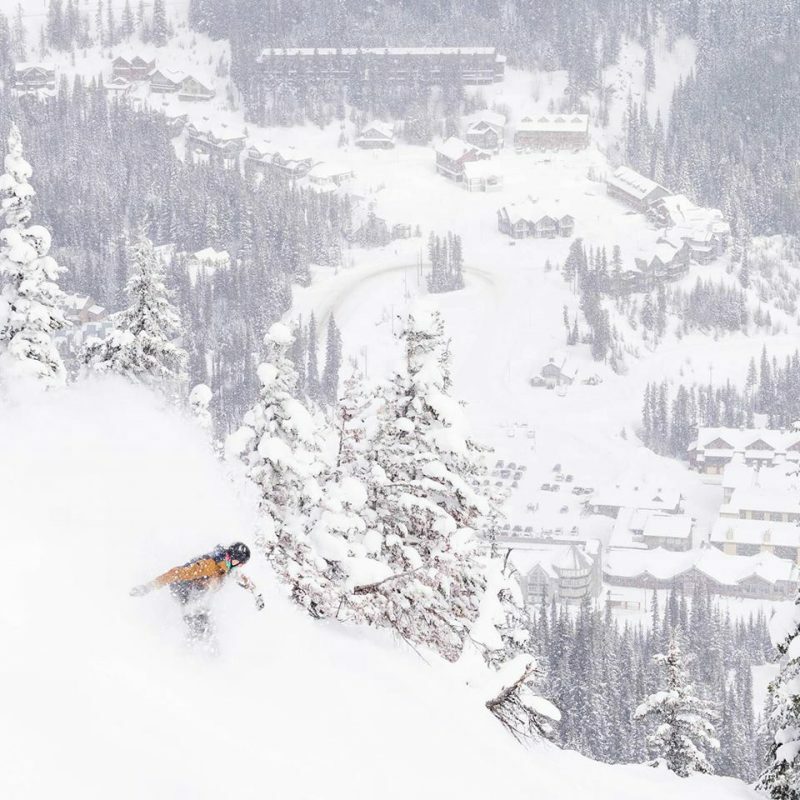 Ski areas have been re-opening slopes in the past week with all five centres open again for the first time in nearly a month since Wednesday. There’s a limited but increasing amount of terrain open and the main problem has been the strong winds of late, which has caused lift closures at times. In between when the wind has dropped and the sun come out conditions have been superb. 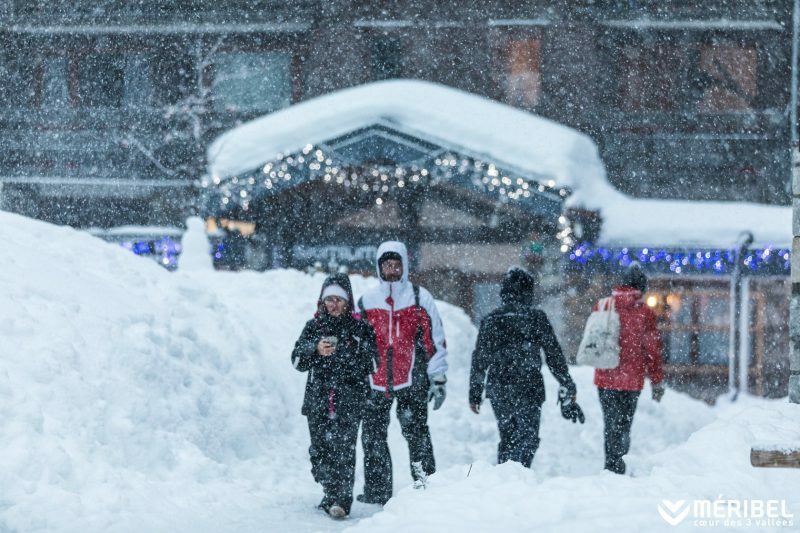 Scandinavia has seen some good snowfalls too and resorts on Norway’s coast like Voss (pictured top after the snow) reported some big 50cm accumulations earlier this week – some of the biggest of the season so far in fact. But there was also snowfall across the region so almost all Scandinavian ski centres have plenty of fresh snow to groom or for off-piste powder. In North America the unending snowy deluge in the west seems to have finally, well, if not ended, certainly eased. Squaw Valley popped to the top of the world greatest snow depth table after the latest huge snowfalls last week hitting 6.3 metres (21 feet) at the start of this week but has now dropped back down under 6 metres after the snowfall finally eased and people could go out and enjoy the snow under clear skies at last. It is still snowing in parts of Colorado, Utah and the Pacific Northwest but this week they’re measuring it in inches rather than feet. 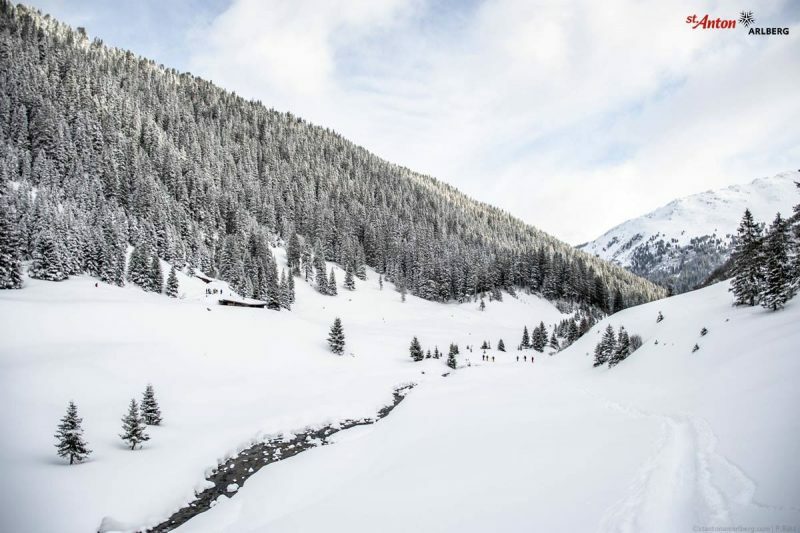 There’s a big change in the weather in the Alps for the start of March with snow falling across the region after the three-week dry spell through the latter part of February. The snowfall has also reached down the Dolomites, and in the past 24 hours to the Pyrenees, where it had been dry for a month. 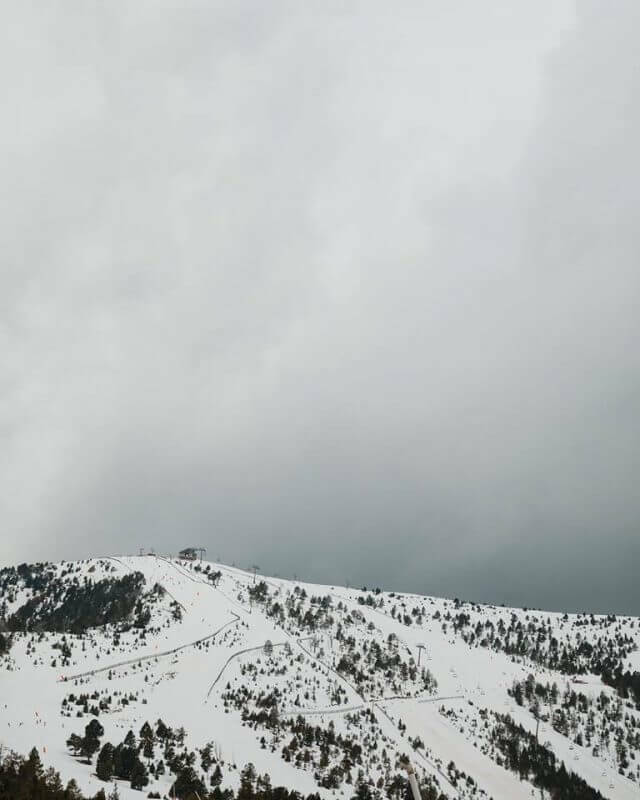 Vallnord in Andorra is pictured below as the snow clouds rolled in. So the result is that much of mainland Europe is getting a fresh snow top up, welcome by most. 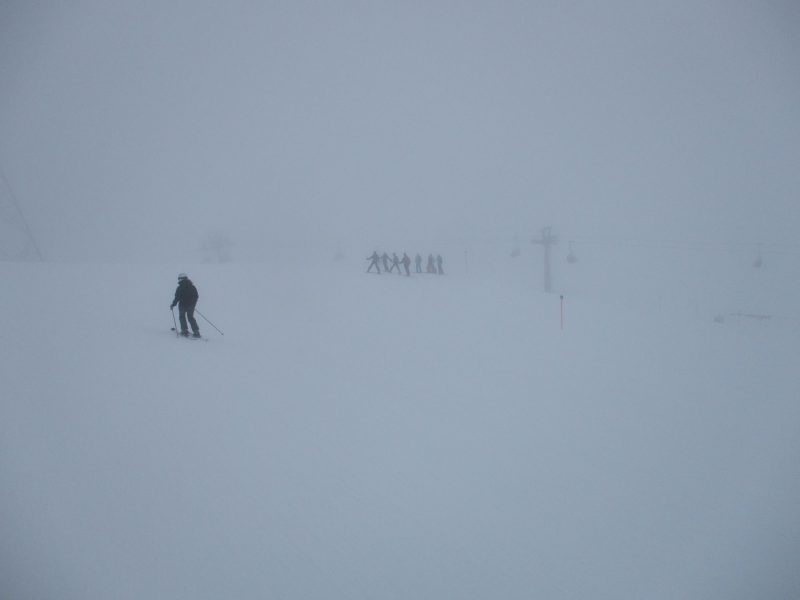 The only downside beyond the low visibility snowfall normally brings, is that the change in the weather has also brought strong winds at times, which have closed some higher lifts and runs. The snow is expected to continue pretty much everywhere for the week ahead. There are some fears that at lower elevations it may fall as rain, but at higher resorts like Obergurgl and the higher parts of the Chamonix Valley, there may be as much as a metre of fresh snow by this time next week if forecasters are correct. 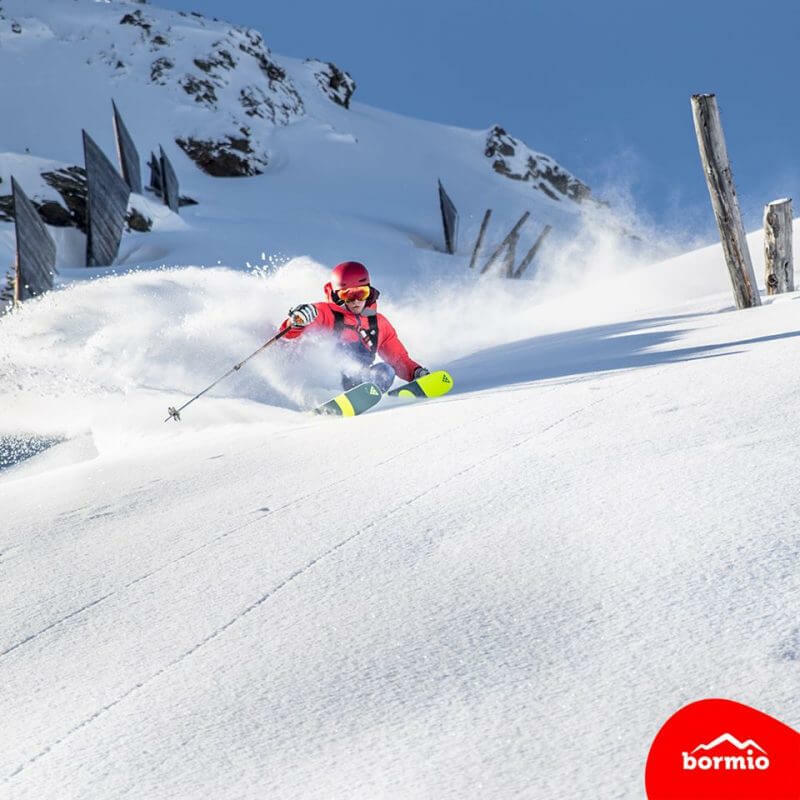 So far resorts reporting 20-30cm overnight accumulations in the past few days have included Bonneval in France, Bormio in Italy (pictured below yesterday), St Moritz in Switzerland and Saalbach (on three separate days in the past week) in Austria. Closer to home the picture has also changed in Scotland after the record warm temperatures of February and slopes in the Highlands are turning white again. 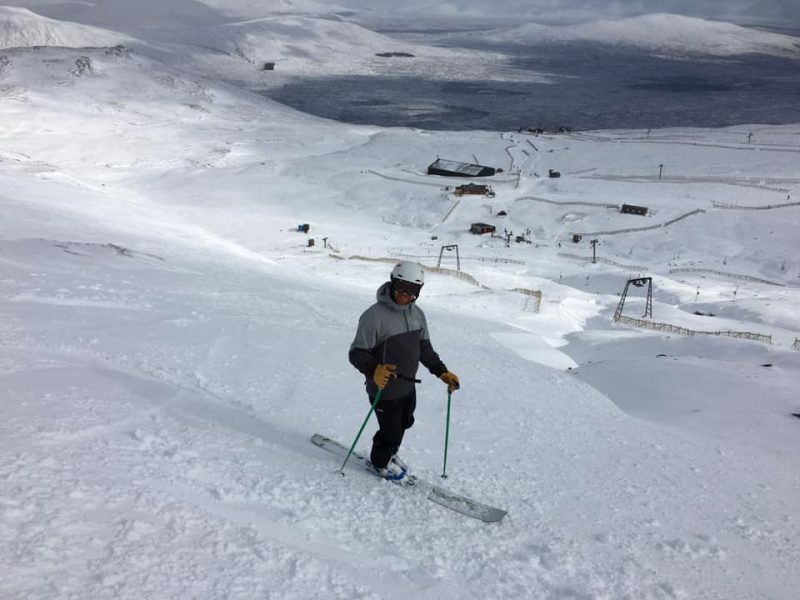 At the time of writing it was still only limited terrain open at the base of the slopes, just for beginners really, at a few areas, but it is a rapidly improving picture and Glencoe for one says they expect to open full runs on the upper mountain this weekend. It's #snowing!Forecast for today is for moderate NW wind and a day of frequent heavy snow showers. We have the Coire Pollach Tow open, early season conditions at present. It’s a snowy picture in Scandinavia too with the snow falling over most of Norway and Sweden’s ski areas and many posting regular 5-20cm overnight accumulations to provide fresh powder each morning. 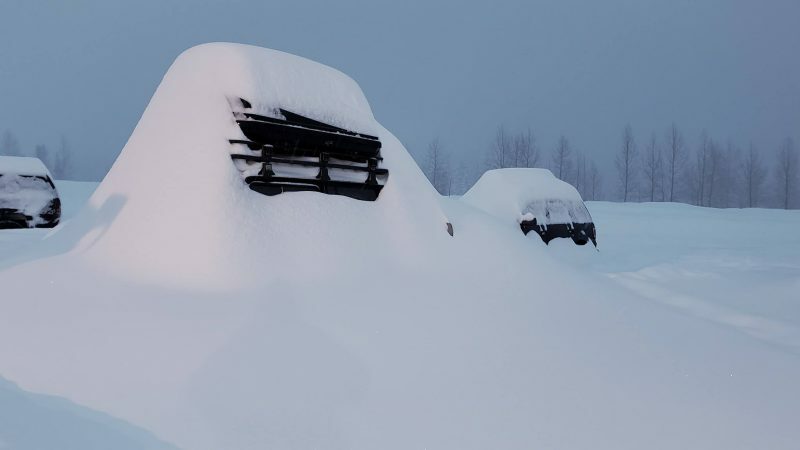 Voss on Norway’s coast reported 35cm in 24 hours to Friday morning – pictured below after the snow. There’s been snow right across the US though, including on the East Coast leading to severe weather warnings across the country and thousands of flight cancellations. North of the border in Canada the weather has been less dramatic with just moderate snowfalls at ski areas from coast to coast. 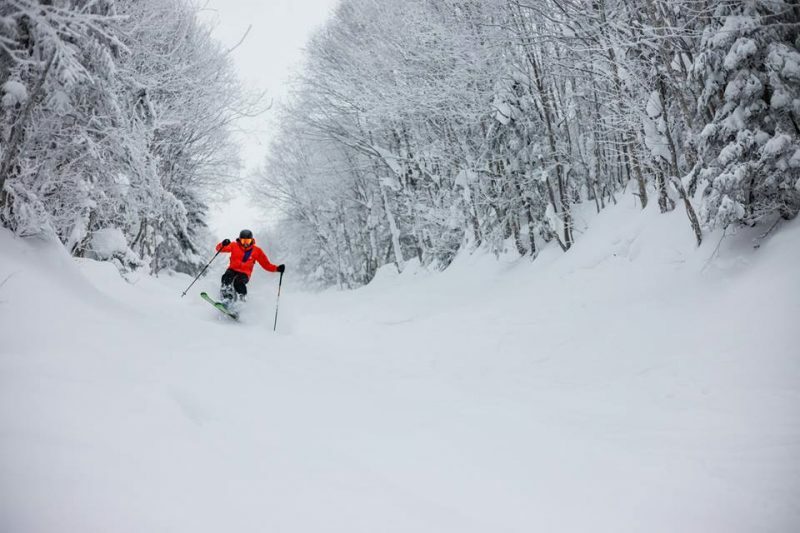 Tremblant has the country’s deepest base at 496cm. The snow is falling again in the Alps, hoorah! Of course it was hard not to enjoy the sunny, warm days on the slopes that have dominated much of February but for those who like fresh powder, or even freshly groomed slopes, spring had come a little too early and it’s a relief to get back to more winter-like conditions – even if these are arriving just as spring itself is supposed to start on March 1st (the meteorological version that is). In the Alps, the snow is expected to be heaviest in the North and West although the full region should get at least some. We’re talking 10-30cm in Eastern and southerly areas and 30-70cm in Northern and western part. The biggest falls are expected in France on Friday, then a bit of a lull before another wave of heavy snowfall at the start of next week – if the forecasts get it right. In the meantime, it has been another warm, sunny week across much of the continent – very like late March/early April often is, less like what February should be like, but still quite pleasant on the pistes until it gets a bit too sticky in the late afternoon. But then that’s all history now anyway with the snow returning and cold weather with it. There was some snow at the end of last week in parts of Austria though, Dachstein West (below) reported 20cm of snow, Saalbach 30cm. The Dolomites and Pyrenees will probably have to wait until the middle of next week before the snow reaches them. And whilst current forecasts are for 40-80cm in the Western Alps (France and Western Italy and Western Switzerland) and 20-40 on the eastern side (Austria and Eastern Switzerland), so far it’s looking like 10-20cm for the Dolomites and Pyrenees, but of course that could change before the snow arrives next week. Closer to home Scottish ski areas have continued to suffer as we’ve basked in record warm days for February in the UK but here too a return to winter is forecast from this weekend as we enter spring and its hoped enough snow will fall along with cold weather for snowmaking for some of the main ski runs to re-open alongside the beginner areas kept open with all-weather snowmaking at Cairngorm, Glencoe and The Lecht. Scandinavia should see more fresh snow and Bulgaria, where there was a foot of fresh snow at the weekend, continues to look good with bases actually increasing here to nearly 3 metres (10 feet) at the snowiest resort, Pamporovo. 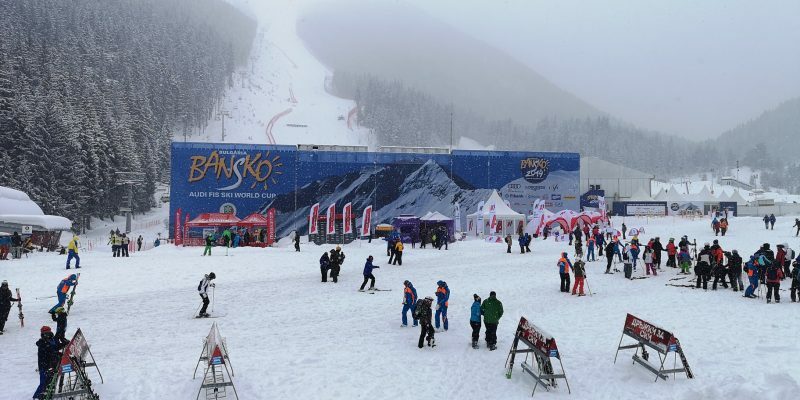 The other Bulgarian centres have plenty of snow too though – Bansko is pictured above on Saturday when World Cup races were postyponed due to the snowfall. It should stay snowy in Canada next week where ski areas across the country reported up to 60cm of fresh snow over the past seven days. The week ahead doesn’t look AS snowy but up to 30cm is still expected in Quebec (again) and around Banff in Alberta. 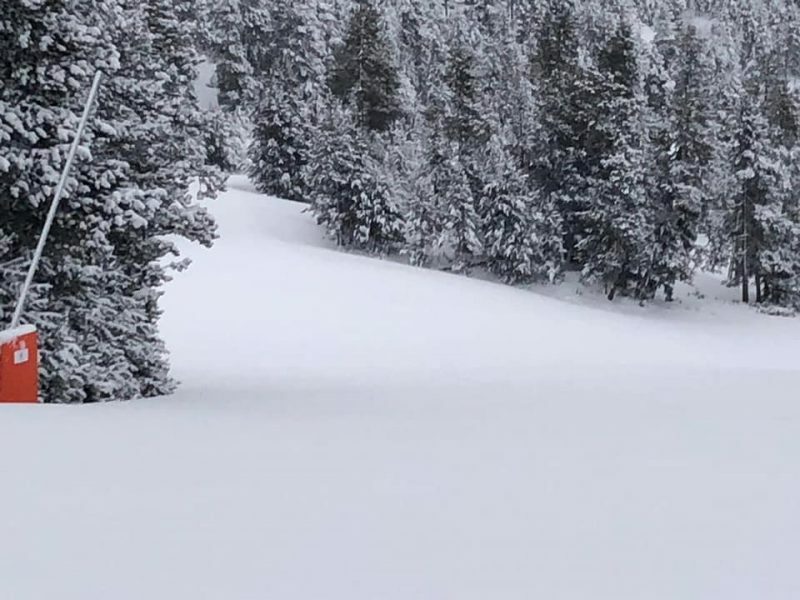 The US has seen another week of very snowy weather to round off February with more huge snowfalls this week in states including California and Wyoming, both seeing resorts post more than 1.5 metres (five feet) of snowfall since Sunday. That’s on top of similar huge snowfalls through February giving resorts like Mammoth, Jackson Hole and Squaw Valley their snowiest ever Feb. All the snow, accompanied by strong winds at times, has caused problems for some areas opening, but once the weather calms down the powder is incredible. 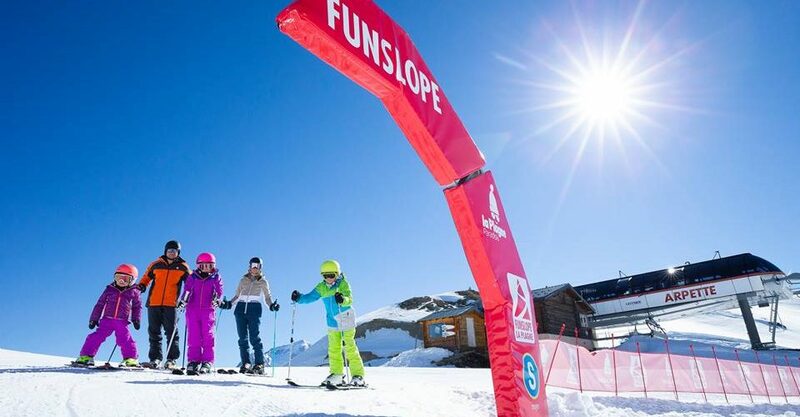 It has been the second week with little or no snowfall for most of Europe’s ski areas with blue skies and perfect conditions on the piste at most resorts for the February half term holidays. Heavy snowfall earlier this month and in January means that despite warm temperatures and spring-like conditions a little earlier than they should be, most have the snow depths to withstand the warmth and have everything open. Here’s Morzine this week. Some have reduced their depth totals by 10-20cm this week, reflecting the thaw, but as most have at least 2 metres lying on upper runs, and some like Andermatt and Engelberg, around six metres, that’s not a big issue as yet. Of course whilst its great on the groomed runs, the chance of finding any fresh powder are diminishing by the day until there’s a fresh snowfall. There’s not a huge change on the horizon still so far, although some colder weather has crept in from the East in recent days bringing light snowfall and subzero temperatures back to parts of Austria and further afield in Bulgaria. But most of the Western Alps, Pyrenees and Dolomites look set to stay dry into a third week next week. Arabba/Marmolada: is it possible to go higher? The only part of Europe which has seen regular snowfalls over the past week has been Scandinavia where most resorts have had 10-20cm of snowfall in the last 7 days and some on Norway’s western coast, including Voss, getting nearer to 50cm. Closer to home though on our side of the North Sea it is not looking good in Scotland. The BBC News reported a village in Aberdeenshire set an all-time February warmth record at over 18C on Thursday, 21st February – and that’s very close to the five Scottish ski areas which hadn’t had a deep snow covering as it was and that’s now pretty much all disappeared. 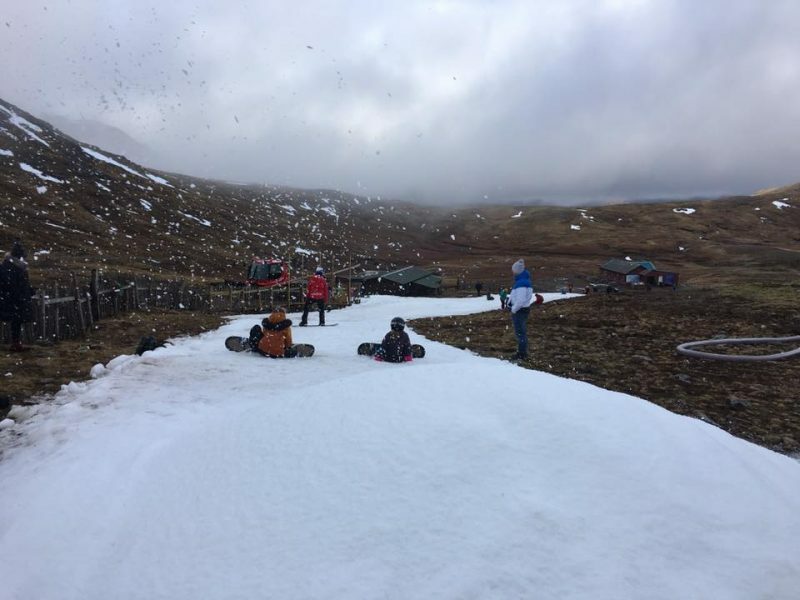 Glencoe (pictured above), The Lecht and Cairngorm are still managing to keep small snow areas for beginners and sledges open though thanks to their new all-weather snowmaking machines purchased this year. Across the Atlantic, it’s a very different picture with snowfall reported almost everywhere and in California, it has continued to be exceptionally heavy snowfall with several resorts now setting February all-time snowfall records, amongst them Squaw Valley and Mammoth each reporting more than 5 metres of snowfall this month alone. 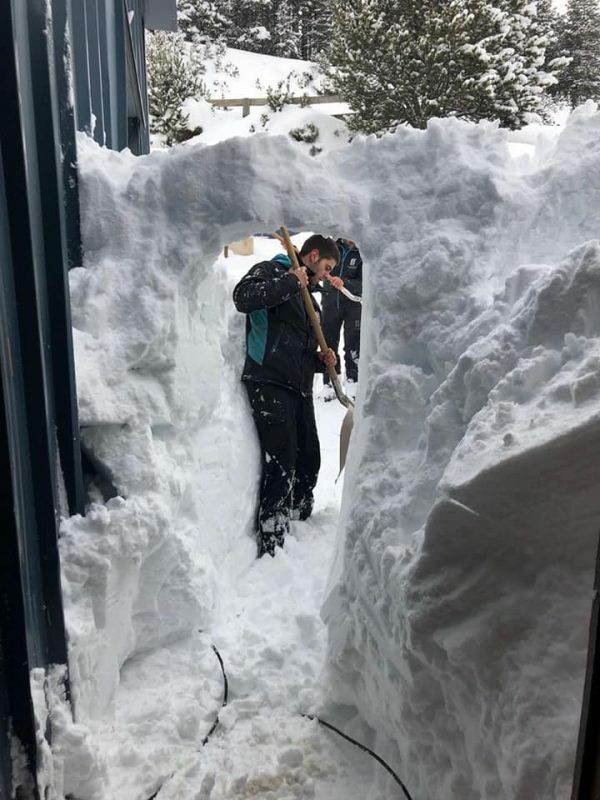 Mammoth has now had more than 13 metres of snowfall so far this season, has it lying 5.7 metres (19 feet) deep and is looking good to stay open to July as it plans. 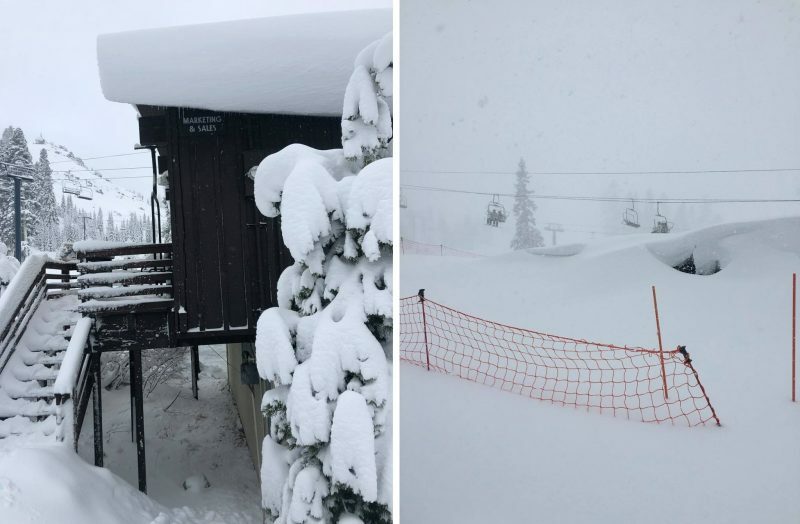 Pictured below are a ‘before’ and ‘after’ picture of a ski hut at Sugar Bowl ski area in California which has reported an average 30cm/foot a day of snowfall every day this month. As mentioned it’s not just the far West though, there have been more good snowfalls in Colorado, Utah and Wyoming, as well as on the East Coast and up across Canada where they’ve been getting excited that temperatures are ‘warming up’ to just below freezing. There’s plenty more snow in the forecast across the continent with the biggest snowfalls expected in the Rockies over the coming week. 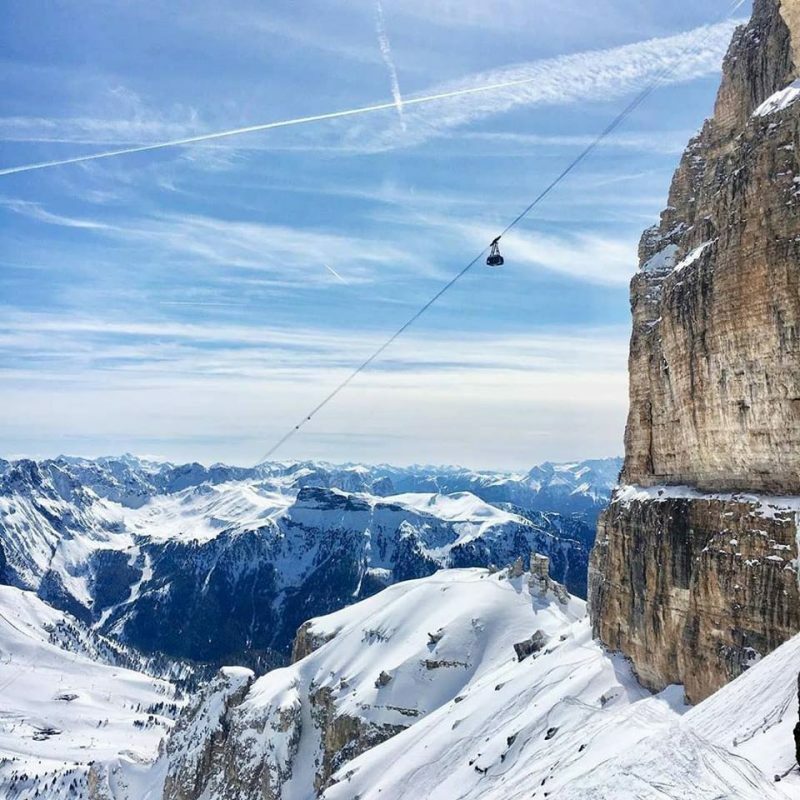 After a mostly snowy first six weeks of 2019 in one region or another the weather has calmed down across the Alps (and indeed the Dolomites and Pyrenees) with predominantly sunny days and great conditions for skiing and boarding. Obergurgl in Austria is pictrured top this week. 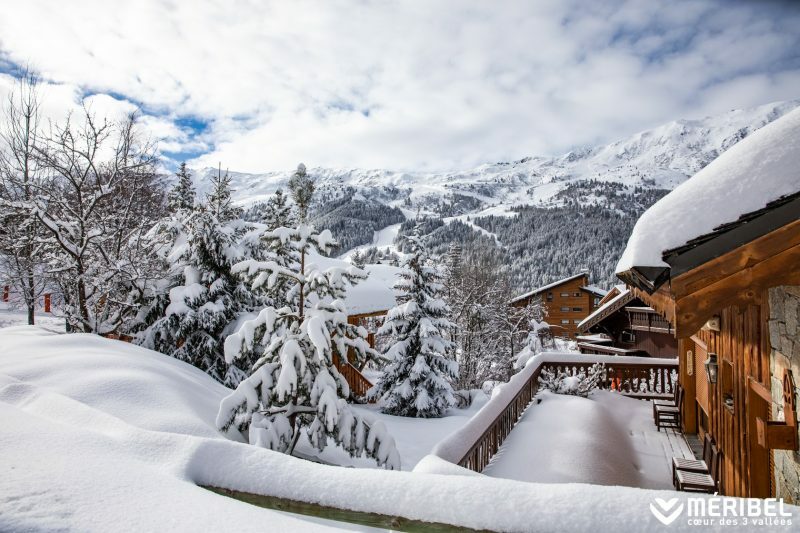 All that snow through January to mid-February has left deep cover at most resorts, with almost all the centres you can book a package holiday to reporting at least a 2 metre base depth and some as much as a six metre base depth. The snow in the Alps is fresh too, there was another big dump last weekend and into the start of this week which gave 30-60cm more snow to most resorts in Austria, France and Switzerland. With all the sunshine this week it has also been getting warmer and it will be feeling ‘springlike’ in many resorts this weekend and into the main half-term week next week. Temperatures may well go well above freezing at village level and even up on the slopes. There’s no real sign of change on the horizon at present either with just the odd centimetre of snow forecast here and there by the snow forecasting agencies, but mostly just more sunshine. The avalanche danger rose up to level 3, considerable, for off-piste skiers and boarders with that heavy snow but has since eased in some areas. There hasn’t been any significant fresh snow in the Dolomites or Pyrenees for nearly two weeks now but conditions remain good after all the snow that fell in later January and early Feb, with deep bases again and all runs open. A light dusting of snow is expected in the Pyrenees at the start of next week which should freshen things up nicely. Spain’s Baquerira Beret is pictured above this week. Conditions are looking pretty good in Eastern Europe too, where the snow has continued falling and temperatures stayed lower through the past week. Bases are also looking very healthy and again pretty much all runs are open. Further north things are looking a little less promising. In Scandinavia, there has been fresh snow but there’s also been a wild mix of weather with temperatures going from below -20 at the start of the week to above freezing with rain, and periods of fog and gale force winds have also impacted skiers. In Scotland, the warm British weather has had a bad impact and the number of runs open which peaked at over 60 midweek is now down below 10 across the five areas and with warm weather expected to continue into next week it’s not looking promising at present. Across the Atlantic there has been no let up in the heavy snowfall in Western North America with more massive accumulations in California and along the Pacific Coast, which has continued over to provide pretty huge snowfalls (60cm instead of 120cm further west) in states like Utah and Wyoming. 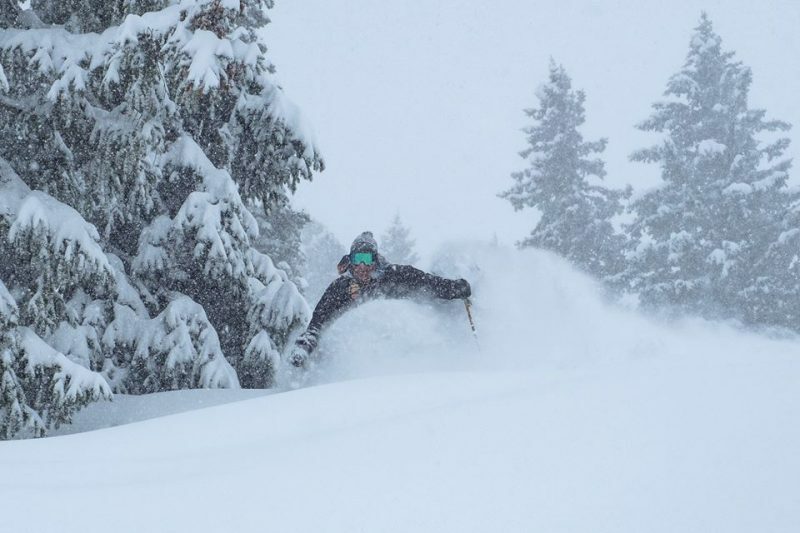 Mammoth Mountain has now had more than 11 metres of snowfall and is sitting on a 5m+ base so has already announced that it’s staying open to at least July 4th this year. Cars at the summit at Snoqualmie in Washington State are pictured above. 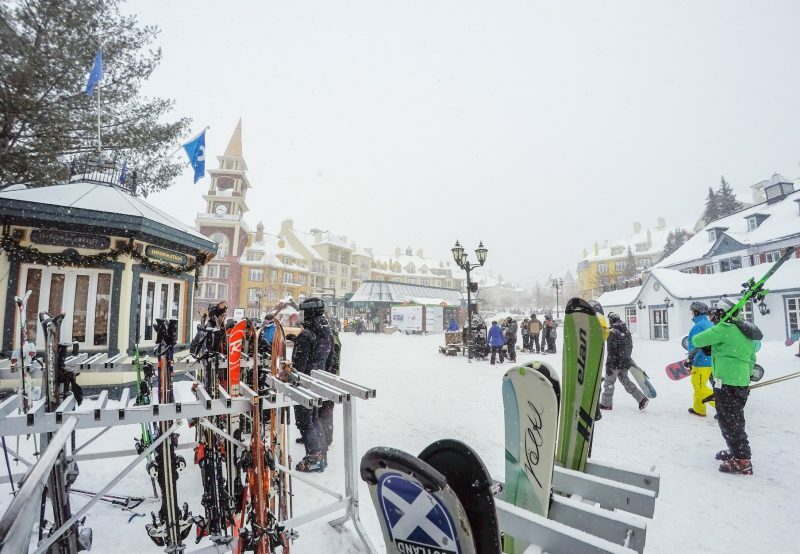 There’s been fresh snow north of the border in BC too and over in the east some big snowfalls in New England and Quebec (includiong at Mont Tremblant below). 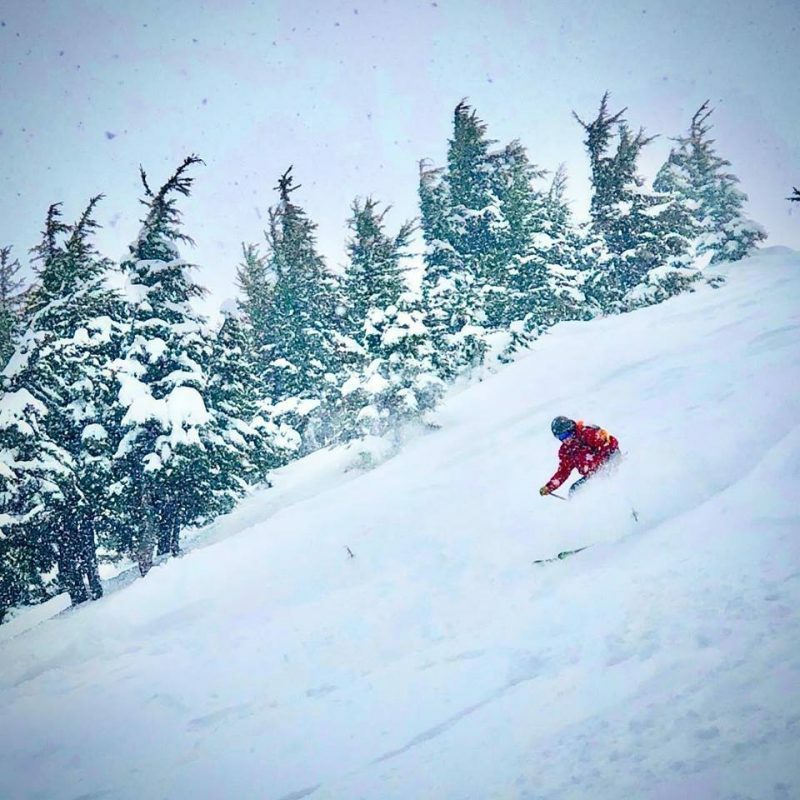 Ski areas around the world seem to be taking a breath this week after huge snowfalls up to last weekend and, in North America, the first half of this week. 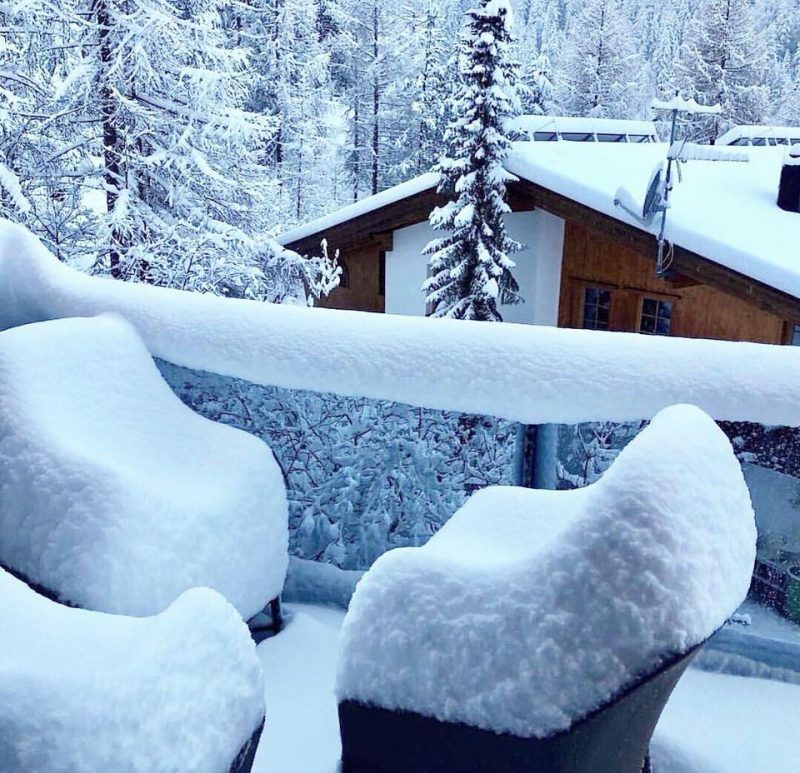 Resorts in the Alps posted snowfalls of typically 50cm to as much as 2 metres by the end of last weekend and similar numbers were reported in the Dolomites (Alta Badia pictured below) and Pyrenees over the same period with the most snow – up to 3 metres (10 feet) reported in California between Saturday and Tuesday. That said, in the past 24 hours things have been turning snowy again in the Alps with a fresh band of snow clouds crossing the area over the weekend with the heaviest snowfall expected on Sunday/Monday. Snow depths are very healthy indeed with most of the continent’s leading ski areas having at least 2 metres of snow on upper slopes, some as much as 3 or 4 metres and a few, including St Anton, Engelberg and Andermatt, above 5 metres. That should take a while to melt in the spring. It has been a great week in the French Alps with lots of sunshine and skiers in the mountains there over the past few days reporting ideal conditions. The snow clouds have moved back in at many resorts now though. Elsewhere in Europe, there were huge snowfalls at the end of last week in the Dolomites. This was particularly welcome as the Italian mountains had not had much snow at all this season until then, although they did have most of their terrain open thanks to near 100% snowmaking coverage. Now the snow is lying deep across the region. Cortina and Val Gardena posted some of the biggest accumulations. Further east still there’s been a lot of snowfall in Bulgaria over the past few weeks and conditions are good here with a deep base developing. 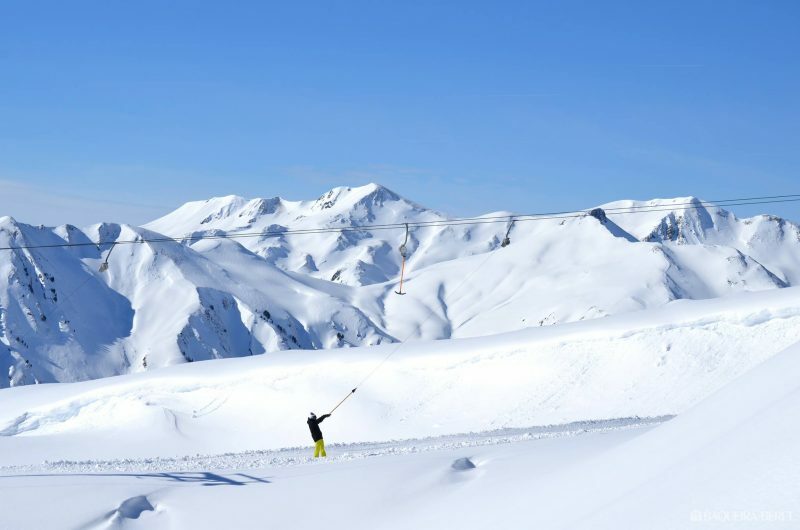 On the other side of Europe, the Pyrenees saw their second week of heavy snowfall leading to resorts in the French Pyrenees now posting deeper snow base depth stats than resorts in the French Alps – although both mountain ranges have healthy numbers. Like the Dolomites, the snowfall has been very welcome after a fairly dry first few months of the season before it arrived. Looking north conditions are again fairly good across much of Scandinavia. It’s been cold and clear so far at Are for the Alpine Skiing World Championships in Sweden with will see Axel Lund Svindal and Lindsey Vonn’s final professional races in the next few days. There has been some fresh snow though with Norwegian coastal ski area Voss reporting 30cm of fresh powder this week. In Scotland, it has been a constantly improving picture through February with bases building and all five areas opening terrain beyond the previously only-beginner terrain available. The Lecht is pictured above this week. Temperatures are rising and it’s a windy weekend ahead which could see some damage to the thin snow cover but hopefully not. In North America, there have been huge snowfalls on the West side of the continent as mentioned above. 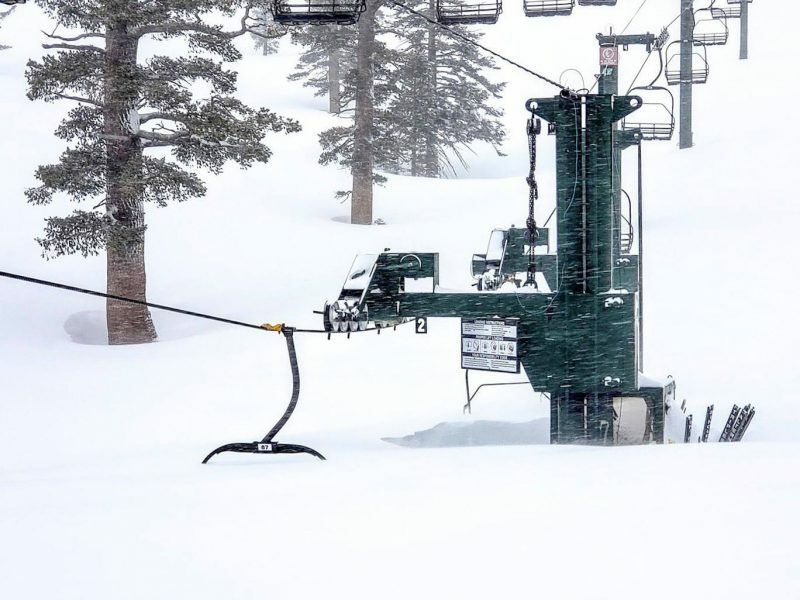 The biggest falls were in California (Kirkwood pictured above) but 1-2 metre accumulations were reported across the western side of the US and it has hardly stopped snowing in Utah where the Freestyle World Championships are underway. Some resorts there have had two metres of snow this week. Elsewhere there has been a bit of a lull since the snowfall was heaviest on Sunday/Monday but a fresh front hitting the West Coast this weekend is expected to bring at least another 50cm by the start of next week. Well for the Start of February the good news is that the snow conditions are looking great almost everywhere. The extremely heavy snow in the Eastern Alps (Austria and Eastern Switzerland) that caused disruption in the first half of January has now eased leaving most areas fully open. 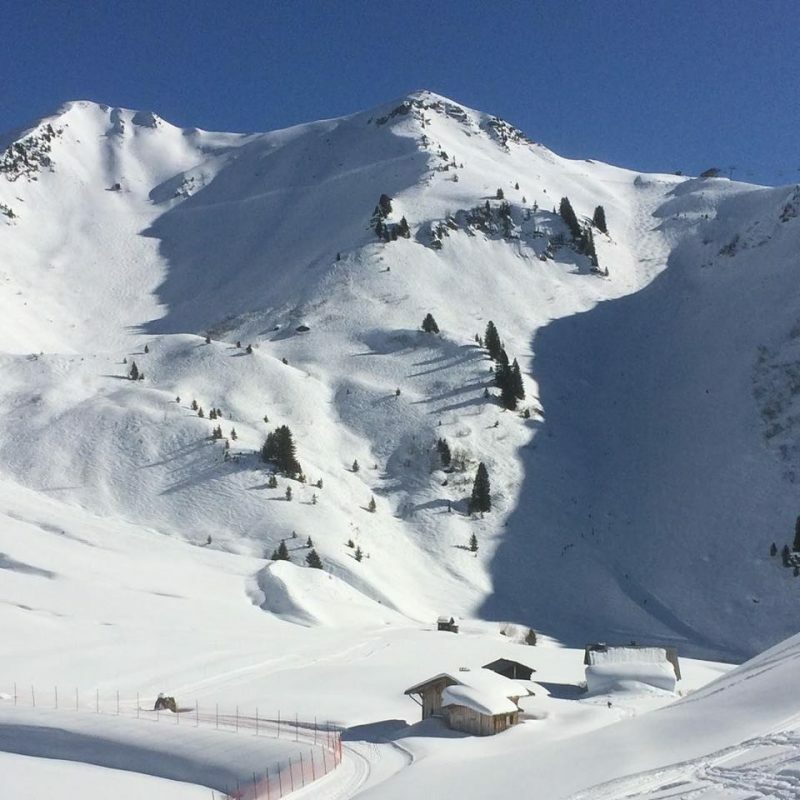 The snow is lying deep across the region now, in fact, the world’s deepest snow base is 20 feet (six metres) deep at the resort of Andermatt in Switzerland, Engelberg isn’t too far behind and St Anton (above) recently pushed through the 5-metre mark for its upper snow depth earlier this week. At the same time The Western Alps (France, Western Switzerland and Western Italy), which had been doing fine but really needed more fresh snow, have had just that over the past 10 days with most resorts receiving several feet (60cm+) of fresh snow but some as much as 1.5 metres of snow. The snow is still falling and expected to continue to be quite heavy through the weekend at many areas, so that could cause travel issues. The snow has also pushed the off piste avalanche danger up to level 5, one below the highest level, 5, meaning it is very dangerous to ski or board off piste at present. The Pyrenees needed fresh snow more than the Alps and in some areas, until about 10 days ago, ski areas were only partially open because of a lack of snow. That has changed big time with the biggest snowfalls in the world over the past fortnight in the Pyrenees. Some ski areas there have had over three metres (10 feet) of snow. So there are amazing snow conditions at present in the French and Spanish Pyrenees, as well as Andorra. Pictured below is digging out at Formigueres in the French Pyrenees. Again the volume of snow, still falling in some places, may cause travel issues and has pushed up the off piste avalanche danger so its vital to be aware of and respect closed slopes and other safety advice. The Dolomites too had not had much snow until recently although pretty much all their groomed terrain was open thanks to their massive snowmaking arsenal. But it is due to snow heavily this weekend here too for a good start to February. It looks like 50-100cm of snow may fall over the next 72 hours, more than most areas there have had all season so far, so that should transform conditions here too. Most of Eastern Europe is looking good too. Large parts of the Northeast of the continent (Czech and Slovak Republics, Germany and Poland) shared in the huge snowfalls in the eastern Alps of early January and there have been several big snowfalls in Bulgaria over the past few weeks leaving the snow nearly two metres deep there. Scandinavia – where the biggest ski competition of the year – the FIS Alpine Skiing World Championships – kick off next week in Are, Sweden, it is mostly good. Finland had a warm start to the season but it is cold now and most areas are fully open. In Norway there have been some substantial snowfalls this week with 50cm of fresh at Norefjell. The only area struggling to open much terrain so far in Scotland, although here too it’s a rapidly improving picture after mostly cold and sometimes snowy weather over the past fortnight. The five Highland areas should all have some runs iopen this first weekend of the month. Across the Atlantic the big news from North America has been the super cold weather (-50F wind chill at its most extreme) in the centre of the continent. This led to the closure of dozens of ski areas where it was too cold for them to operate safely. However most of us head to ski areas on the West or East side of the continent where it has been cold, but not so much. The East has had the most snow over the past week but there was already a good base from big snowfalls from November on in the west and more fresh snow is arriving this weekend and into next week there. 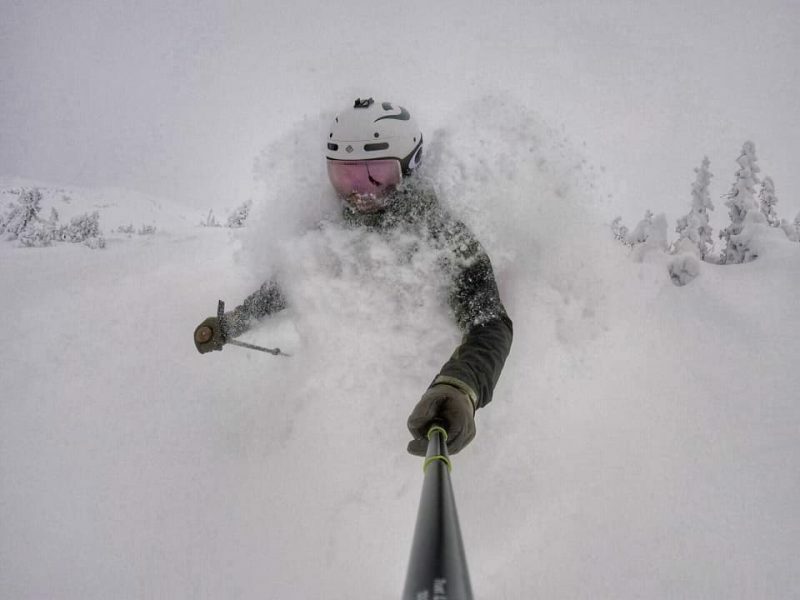 Revelstoke in BC has had more than 7 metres of snowfall so far this season. Panorama in BC is pictured top. Tremblant in Quebec below. Finally, Japan – a fairly classic winter it seems with plenty of deep powder and Niseko passing the 7-metres-snowfall-to-date tally already.